42 • August 2018 • S I G N & D I G I T A L G R A P H I C S DIGITAL PRINTING AND FINISHING DIGITAL GRAPHICS Versatility Illustrator provides five types of brushes (Figure 7) including Calligraphy, Scatter, Art, Bristle, and Pattern brushes. Each type of brush has specific controls that enable the customization of char- acteristics so that the possibilities to produce virtually any effect are limitless. 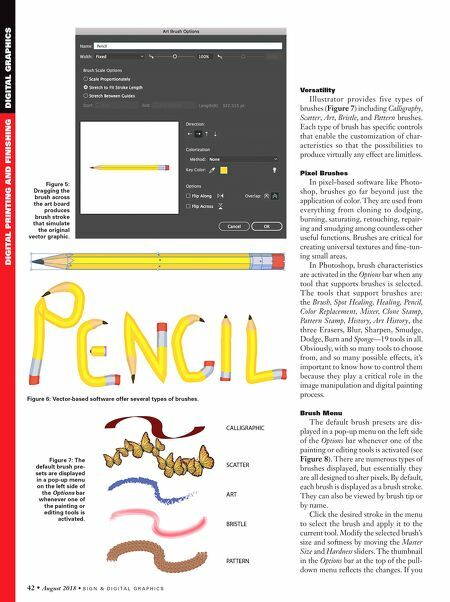 Pixel Brushes In pixel-based software like Photo- shop, brushes go far beyond just the application of color. They are used from everything from cloning to dodging, burning, saturating, retouching, repair- ing and smudging among countless other useful functions. Brushes are critical for creating universal textures and fine-tun- ing small areas. In Photoshop, brush characteristics are activated in the Options bar when any tool that supports brushes is selected. The tools that support brushes are: the Brush, Spot Healing, Healing, Pencil, Color Replacement, Mixer, Clone Stamp, Pattern Stamp, History, Art History, the three Erasers, Blur, Sharpen, Smudge, Dodge, Burn and Sponge—19 tools in all. Obviously, with so many tools to choose from, and so many possible effects, it's important to know how to control them because they play a critical role in the image manipulation and digital painting process. Brush Menu The default brush presets are dis- played in a pop-up menu on the left side of the Options bar whenever one of the painting or editing tools is activated (see Figure 8). There are numerous types of brushes displayed, but essentially they are all designed to alter pixels. By default, each brush is displayed as a brush stroke. They can also be viewed by brush tip or by name. Click the desired stroke in the menu to select the brush and apply it to the current tool. Modify the selected brush's size and softness by moving the Master Size and Hardness sliders. The thumbnail in the Options bar at the top of the pull- down menu reflects the changes. If you Figure 5: Dragging the brush across the art board produces brush stroke that simulate the original vector graphic. 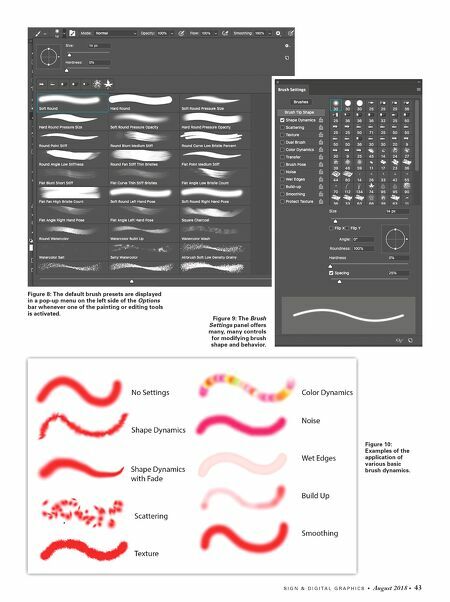 Figure 6: Vector-based software offer several types of brushes. Figure 7: The default brush pre- sets are displayed in a pop-up menu on the left side of the Options bar whenever one of the painting or editing tools is activated.